Please welcome Stephanie Cowell, author of the new release of Claude and Camille, as it is the main attraction for this month's event at the Historical Fiction Bloggers Round Table. When I look back, I feel I was destined to write a novel about a painter and somehow settled on Claude Monet. My parents were both artists. 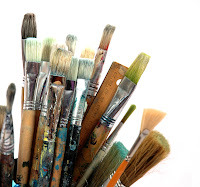 I grew up in the shadow of the easel, passing carefully by marmalade jars full of delicate sable brushes for pen and ink drawing, sturdier bigger ones for oil paint and colored pencils. My parents took me to museums and art exhibitions since my earliest memories when about all I could see were grown-up people’s legs and the bottoms of picture frames. Artists came to the house. The air always smelled of oil paint. And I learned the stories of the struggles of the great painters. 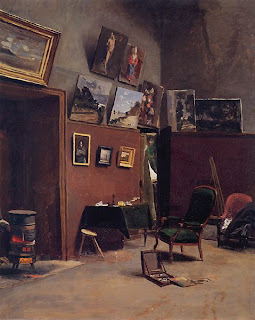 But painting was the center of my life and even now, when I am tired of words as novelists can sometimes be, I wander in the Metropolitan Museum which is near my house and feel so enriched. But one thing my parents admired of me was my ability to tell stories. And at one of my early readings, a woman turned to my mother and asked, “Do you write like your daughter?” My mother shook her head with a smile. And I think from that I learned that we all feel and love a great deal but the gift with which we express it is different: cooking, writing, sewing, gardening. I still have my mother’s marmalade jar but now it is filled with pens. Thank you so much to Stephanie for sharing with your readers the story behind your inspiration of your latest novel, Claude and Camille, which is available for purchase today! Please visit the Historical Fiction Bloggers Round Table main page for the Calendar of Events featuring Stephanie and her novel Claude and Camille! If you would like to win your very own copy of this book, then please comment on this post telling us anything you have previously learned about Monet or impressionism or if you have seen any of his paintings at a museum. LEAVE YOUR EMAIL ADDRESS. For an extra point, tweet this post or facebook post it, leaving me a link to your status. Book Giveaway open until April 16th to USA residents only.